Mention handles are used to notify team members in internal messages. This handle can be updated from Settings. All Karbon users and teams are given a mention handle, which is used to by other colleagues to notify them in internal comments and notes. This handle can be updated in Settings. To update your own handle, click your name from the main left-hand menu. Or, to update another colleague, go to Settings > Colleagues, and locate the colleague who you want to update the handle of. 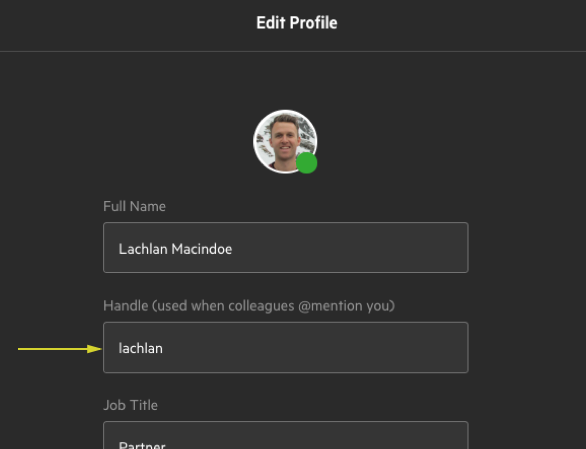 Choose to Edit your own or your colleague's details, where you'll have the option to change the Handle.